Thermal fluid heating is a type of indirect heating in which a liquid phase heat transfer medium is heated and circulated to one or more heat energy users within a closed loop system. Thermal oil, glycol and water are common heat transfer media. The Sigma Thermal HC product line offers two types of standard thermal fluid heating system packages: HC-1 and the HC-2. For customized needs, Sigma Thermal offers engineered thermal fluid heaters. 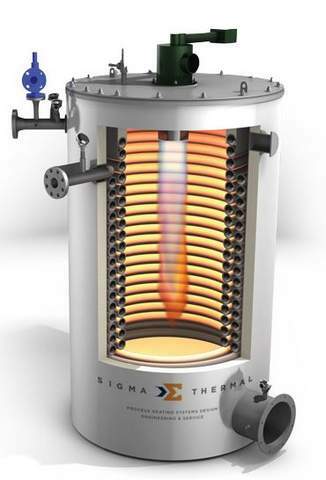 Sigma Thermal offers standard thermal fluid heaters, custom engineered thermal fluid heaters, complete thermal fluid systems and a full range of parts and support for customers' processes. Thermal oil allows for high temperature operation (up to 600°F with organic thermal oils and 800°F with certain synthetics) at very low pressures. Due to the low operating pressure and properties of thermal fluids, most heaters are built to ASME Section VIII; a licensed boiler operator is not typically required. The phrases thermal oil heater, thermal oil system, thermal oil boiler, thermal fluid heater, thermal fluid system, thermal oil boiler, hot oil heater, hot oil system, and hot oil boiler generally all refer to the same type of closed loop liquid phase heat transfer system. Some people use the terms "thermal oil boiler" or "thermal fluid boiler" even though most systems do not involve vaporization. Due to its superior thermophysical properties, water is an ideal heat transfer medium. Closed loop liquid phase hot water or glycol solution systems are an excellent choice for indirect process heating up to approximately 300°F. Because the water is used in a closed loop with no direct feed water source, heaters are typically built to ASME Section VIII and do not require a licensed boiler operator. Heaters can be built to ASME Section I when required.